Small Law Firm Care & Attention"
"Big Law Firm Quality - Small Law Firm Care & Attention"
Pishevar & Associates has been balancing the scales of justice for over two decades. We are a full service law firm of experienced Maryland personal injury lawyers providing legal services for the needs of our clients. Call today to schedule a detailed consultation. Our Mission is: "To zealously and ethically perform high quality legal work and advocacy in the best interest of our client while never either overestimating nor underestimating the adversary…"
Maryland, District of Columbia, The Fourth Circuit and United States Supreme Court. "Top Personal Injury Verdicts and Settlements"
Fox News: A.P. 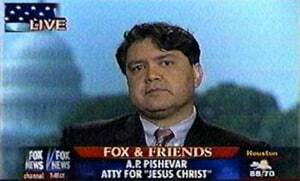 Pishevar - Attorney for "Jesus Christ"